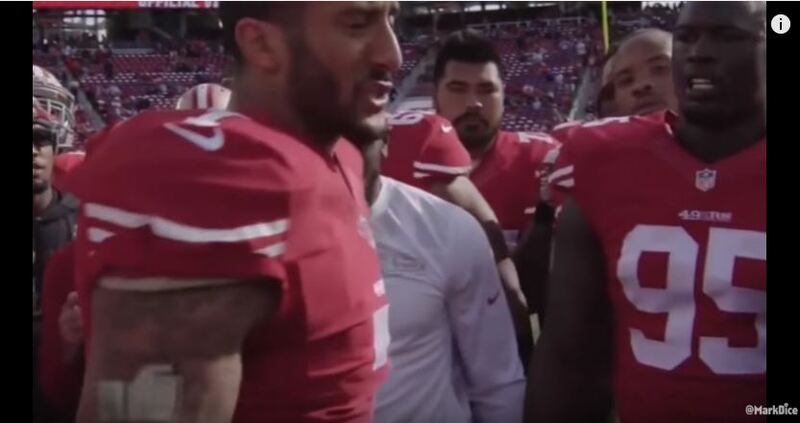 San Francisco 49er quarterback Colin Kaepernick is under a great deal of fire for his refusal to stand for the national anthem, and rightly so. Naturally, the so-called “mainstream media” views him as something of a hero. But it seems the Democrat-media complex loves Hillary Clinton even more. You see, Kaepernick said something about the Democrat nominee that the media has largely ignored. While calling Donald Trump a racist, he also said Clinton should be in jail. Aside from a few sports outlets, not much has been said about his comment, according to Outkick and Newsbusters. Okay, that’s a pretty big news story, right, an NFL quarterback who is the center of a media firestorm for his refusal to stand for the national anthem explains his stance by saying he believes one candidate is “openly racist” — which isn’t true, but whatever — and the other should be in jail. Given that tons of people have already called Trump racist that story isn’t particularly newsworthy, but it certainly should be covered. But have any other prominent pro athletes being covered for their political beliefs said they believe Hillary Clinton would be in jail if she were any other person? That’s a pretty big story, isn’t it? So I expected to wake up this morning and see that story echoing all over the Internet. After all, if we care so much about Colin Kaepernick’s political opinions, his belief that the Democratic candidate for president should be in jail, is kind of a big story, right? I mean, Colin Kaepernick’s ability to garner every left wing opinion maker’s butterfly kisses on one day and then give them the Heisman the next day is positively Clay Travisian of him. Instead, hardly anyone has even Tweeted the quote in the entire media and Outkick is one of the only places in sports media that will feature it today as a story. Good question, but I think we already know the answer. In any other world, an athlete with the total focus of American sports media on him, who takes an open-handed slap at nominees of both parties would be an incredibly big news story. Yet, this portion of Kaepernick’s remarks don’t lead the discussions on any of the panel shows, nor are they featured on any op-eds that I’ve seen. Yes, Kaepernick also takes a shot at Trump here. But we know the media doesn’t hesitate to run stories of athletes criticizing Trump. If Kaepernick merely attacked Trump, these comments would be all over the place. The reason you’re not seeing this more is because of his attack on Clinton. What Kaepernick did was outrageous, and his “reason” for doing it is also outrageous. But what’s even worse is the media’s refusal to tell us the whole story, even though it hurts their favorite candidate. Just once, it’d be nice to see the media actually do its job.